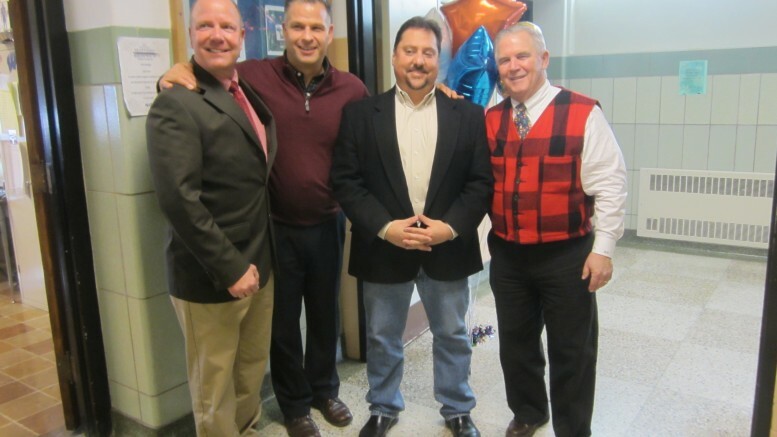 John Morrison, Jay Brinker, Joe Cantafio, and Superintendent Dr. Mark J. Crawford. Joe Cantafio was nervous the morning of Friday, Dec. 18, when he saw Superintendent Dr. Mark J. Crawford and Deputy Superintendent Timothy Oldenburg standing in the doorway of his classroom at West Seneca West Senior High School. Cantafio, who is the president of the West Seneca Teacher’s Association, was worried there was an issue at hand. To his surprise, he stepped out the door to find smiling faces, balloons and cupcakes. “We are here because you are this year’s Educator of the Year,” said John Morrison, outgoing president of the West Seneca Chamber of Commerce. A look of shock appeared on Cantafio’s face as he received praise from Morrison, Oldenburg, Crawford, as well as staff members and his nominator, Jay Brinker, principal of West Senior. “I’m honored and humbled,” Cantafio said, still in a state of shock that he won after being nominated for many years. A lover of sports, Cantafio started coaching in West Seneca in 1990. He has coached wrestling (including the first modified team), lacrosse (the East/West combined varsity team and the head coach of the first West varsity team) and football (modified, junior varsity and varsity at East and West, including head coach of West varsity from 2005-14). Now that his triplet sons are at West Senior, he is a volunteer coach for football. He has also been the Varsity W Club advisor since 1999. Outside of his work in the classroom, Cantafio has been an advocate for the district, standing up against Governor Andrew M. Cuomo. He helped create a rally held in February to push back against Cuomo’s attempts to use school funding as a bargaining chip for changes to teacher evaluations and other education reforms. At the West Seneca Central School District Board of Education meeting held in December, Cantafio presented a “Resolution for Our Schools” to the board, demanding legislators support local control of education and fully fund their schools. The board approved the resolution 7-0 and the room gave Cantafio a round of applause and a standing ovation. Cantafio will be honored at the 69th annual West Seneca Community Awards Dinner to be held Thursday, Feb. 11 at Kloc’s Grove, 1245 Seneca Creek Road, West Seneca. Fellow honorees include Business of the Year, Eileen’s Centerview Bakery; Citizen of the Year, Joan Lillis; Community Service Organization of the Year, Kids Escaping Drugs; and Chamber Member of the Year, Carmen’s Catering. Be the first to comment on "Joe Cantafio named West Seneca’s Educator of the Year"